Like all good builders, James P. Whitesell laid a sturdy foundation for a family business that would persevere for 50 years— and counting. Jim started Whitesell Construction Co. in 1957 as a construction company that built largely residential properties in Burlington County. When his son, Thomas, took a management role a few decades later, the business was established and ripe for the innovative thinking of a new generation. Tom changed course, positioning Whitesell Construction as a commercial builder that owned and managed its facilities with the in-house expertise of architects, engineers, property managers and, eventually, leasing agents. 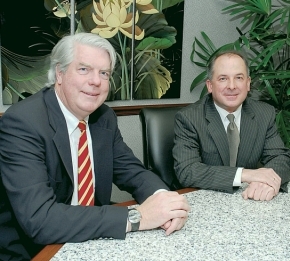 The company built and operated its first office park in Mount Laurel in 1985 and has never looked back. Today, Whitesell owns more than 9 million square feet of industrial, office and retail properties, all of which have been designed, built and managed by its in-house staff of more than 100 employees. Whitesell Construction is undergoing a changing of the guards. While Tom Whitesell is still active in the organization, he has turned the operating responsibility over to Cureton and Tom Heitzman, executive vice president. While bigger is better in development, Cureton stresses that Whitesell Construction’s success has been most closely connectedto its local commitment. Says he: “We believe in living in the communities, touching the communities, helping the nonprofits and being involved in the communities in which we do business.